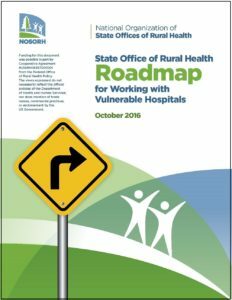 NOSORH recently released the State Office of Rural Health Roadmap for Working with Vulnerable Hospitals to provide resources and models to assist SORHs providing technical assistance for hospitals in jeopardy of closing. This Roadmap was developed at the request of the Federal Office of Rural Health Policy (FORHP) in response to the increasing number of hospital closures over the past several years. The Roadmap is full of resources and tools that SORHs, hospitals and communities can use to assist with the hospital transition process, which might mean closure of the existing inpatient facility as it currently operates, and the transition to a new service delivery model. While the focus of the Roadmap is on vulnerable hospitals, it can be a resource for all SORHs working with hospitals on various aspects of healthcare reform. It also includes tools and SORH examples to inform the efforts of SORHs in supporting rural communities’ efforts to ensure health care services for the people they serve. NOSORH is offering a free webinar on Wednesday, December 7 at 1 pm EASTERN to review this resource and hear directly from two states who have been working with vulnerable hospitals over the past few years. This webinar is intended for State Offices of Rural Health. Click here to register. Thank you to the many partners and SORHs who contributed greatly to the production of this document. For more information on how to access these tools and resources, contact Kassie Clarke at kassiec@nosorh.org. It was a big loss to the state of Georgia when four rural hospitals closed over the course of two years. The closures gained state and national attention, and started a much needed conversation among rural health care leaders: How to help a rural community after a hospital closure. “Four hospitals is a lot to lose in our rural communities,” said Charles Owens, Executive Director of the Georgia State Office of Rural Health. In May 2014 Georgia enacted regulations that would allow a closed rural hospital to be reopened as a freestanding ER department within 12 months of the initial closure. The facility would need to be located in a rural county within 35 miles of a licensed general hospital, be open 24 hours/365 days a year and provide non-elective surgery and emergency treatments. Freestanding ERs must also maintain a license through the Healthcare Facility Regulation (HFR), and cannot house a patient for more than 24 hours. To date, no closed hospitals have reopened as freestanding ERs. Owens is a member of the governor appointed Rural Hospital Stabilization Committee. The committee meets publicly to discuss the freestanding ER model and consider the pros and cons, as well as additional opportunities to bring health care resources to rural communities. “We are evaluating what it takes to operate a freestanding ER and what the patient levels would need to be to sustain itself,” he said. “We are evaluating reimbursement and regulations and are also developing recommendations for communities to consider.” In addition to the committee, Owens has also been appointed the Rural Hospital Point of Contact for Georgia’s rural hospitals to assist them in addressing any challenges they are facing. According to Owens, a freestanding ER is preferable to an urgent care facility in some communities due to “community perception and the potential for available diagnostics and other ancillary support if the community can support the added costs.” Additionally, urgent care facilities are restricted by Certificate of Need in most states.